There is good news for the believers who remain alive on earth after Armageddon and Christs return. He will rule the Earth for 1000 years! Life expectancy will increase dramatically. This 1000 year period is referred to as the “Millennium”. There will be peace on earth until the end of the 1000 year reign. Isaiah, a prophet from the old testament prophesied the future. How do I know that this passage is speaking of the 1000 year millennium? Well, I don’t for sure. However, the passage mentions people living long lives. If this were after a new heaven and earth, there will be no one around in a mortal body. 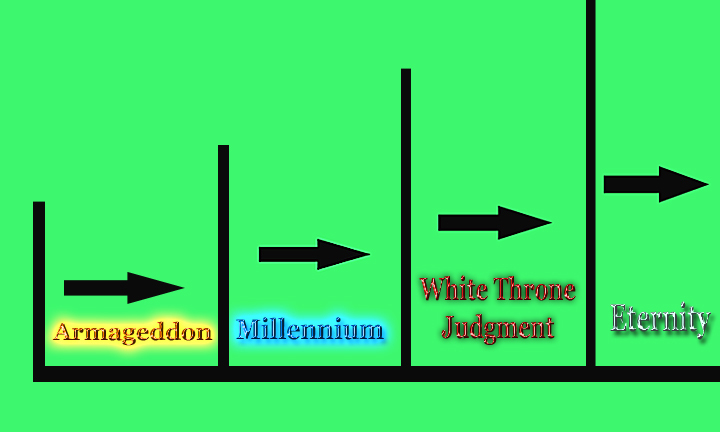 Christ will have already judged those at the end of the millennium and all those alive in the book of life will be given new immortal bodies, like during the rapture. It clearly states that his people will live as long as trees. It also mentions wild animals living together in peace and harmony, that they shall not hurt or destroy in all of God’s holy mountain. When on earth has this ever happened, other than at the creation of Adam and Eve? Never has, never will until this time. The book of Revelation also speaks of the 1000 year reign of Christ. “2 He laid hold of the dragon, that serpent of old, who is the Devil and Satan, and bound him for a thousand years; 3 and he cast him into the bottomless pit, and shut him up, and set a seal on him, so that he should deceive the nations no more till the thousand years were finished. God will bind Satan, the devil, and cast him into the bottomless pit for a thousand years. During this time only those who have not worshiped the beast (Satan) will live and reign with Christ. Whoever has part of the “first resurrection” is blessed and holy! The first resurrection is composed of believers who accepted Christ before the 1000 year Millennium period, the “second resurrection” is for the unbelievers, the unsaved who did not accept Christ before this time. So what happens to the people who are born into this world during the 1000 year Millennium? What if they reject Christ? Revelation chapter 20 goes on to tell us what will happen. Just like the passage states, Satan will gather together all of those people who have rebelled against God. They shall come against the believers for battle. However, God destroys them with fire from heaven. This does not mean that they shall not endure hell, rather their bodies will be resurrected for final judgment, the “Great White Throne Judgment”. Anyone whose name was not found in the book of life was thrown into the lake of fire. That would be everyone present at this judgment. None of them shall escape, this is the second death. They shall all live for eternity in hell! Read: Hell. After this God will destroy heaven and earth, and replace them with a new heaven and earth. All those placing their trust, faith and salvation in Jesus Christ shall be God’s people. He will be with them for all eternity! They shall neither die, nor mourn, nor cry or feel any pain. Accept Jesus now as your personal Lord and Savior! “There is good news for the believers who remain alive on earth after Armageddon and Christs return. He will rule the Earth for 1000 years! Life expectancy will increase dramatically. There will be peace on earth until the end of the 1000 year reign. Isaiah, a prophet from the old testament prophesied the future. Good question Michael. I know that during the one thousand year reign of Christ on earth, there will live believers in Jesus Christ, both living humans, and also the saints who have been changed into immortal bodies. Therefore, the heavens and the earth have not been burned up yet. Remember, one day to the Lord is like one thousand days to man. So everything that happens on “The day of the Lord”, does not necessarily happen in one human day, but could actually occur over a one thousand year period (plus or minus).